Map of the Philippines locating the epicentre of a 6.8-magnitude quake. 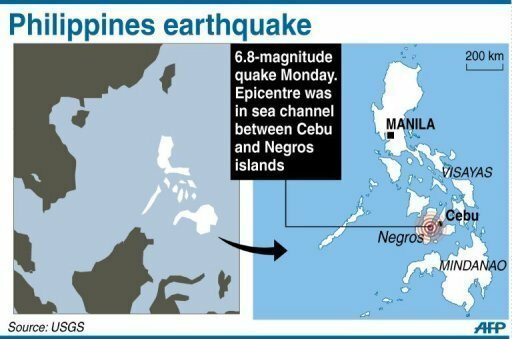 The 6.8-magnitude quake hit a narrow strait between the heavily populated islands of Negros and Cebu around lunchtime on 6 Feb 2012 with more than 200 aftershocks, some nearly as strong, causing further panic throughout the day. Rescuers in the Philippines dug through rubble with shovels and their bare hands on 7 Feb after a powerful earthquake triggered landslides, collapsed homes and killed dozens of people. The Philippines sits on the Pacific "Ring of Fire" -- a belt around the Pacific Ocean where friction between shifting tectonic plates causes frequent earthquakes and volcanic activity. 0 Response to "Earthquake in Philippines"